IRS agents in Cincinnati inappropriately singled out groups like the Tea Party or Patriot party while reviewing their nonprofit qualifications. The IRS insisted they had done so to make for easier processing and not because of any political bias, but the White House said there’s no question the behavior was inappropriate. NBC’s Tom Costello reports. >>> supposed to be used for political purposes as a lever of government against those who may not agree with the government. but today the irs has apologized for singling out some conservative groups for scrutiny last year. nbc's tom costello also in our d.c. newsroom with more tonight. good evening. >> reporter: this involves groups applying for tax exempt status and social welfare organizations. the irs apologized for targeting for skroot any and holding up applications from groups it thought were politically conservative . when the tea party was at its most vocal during the 2012 election cycle the irs now admits its agents singled out tax exempt applications from conservative groups scrutinizing them with tea party or patriot in the names. at the time the bush-appointed head of the irs insisted no group was being singled out. >> there is absolutely no targeting. this is the kind of back and forth that happens when people apply for 501-c-4 status. >> reporter: the irs conceded employees grouped together 75 applications but only because it made for easier processing. >> they didn't do it because of any political bias. they did it because it was their shortcut way of describing the cases for centralization. >> reporter: conservative commentators, however, are not buying the explanation. >> they were targeting conservative, slash, right wing groups. harassing them. making it doubly tough for them to qualify for tax exempt status . >> reporter: in ohio, the former president of the liberty coalition says his state group was targeted by the irs which demanded lists of members, donors, even family members and politicians who have spoken. 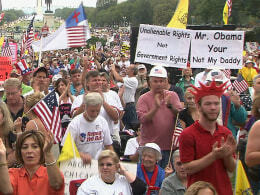 >> they were trying to identify who's in the tea party movement and what we know and what we are planning to do. that's pretty obvious to me. >> reporter: to another group the liberty township tea party , the irs sent a seven-page letter demanding to know its relationship with a private citizen who wasn't even a member of the group. >> what does that translate to? does it translate perhaps to an audit? does it translate to probable cause on something else? >> reporter: today the white house said something went wrong at the irs . >> there is no question if this took place it is inappropriate and there needs to be action taken. the president would expect it will investigated and action taken. >> reporter: meanwhile republican leaders today blasted the irs accusing it of engaging in shameful abuse and calling for congressional hearings . >> we need to know who did this, when they did it, why they did it. >> reporter: the irs won't say whether any irs employee will be disciplined, but it does say these were career employees, not political appointees. the irs inspector general is also conducting an investigation. brian?